I have a love of purple that is mainly unrecognized. My first love is green, but apparently from my clothing and yarn stash colors, I am carrying on a rather torrid affair with red and purple, too. I decided to use a purple mohair and a purple cotton with random and tiny slubs of colors like red, yellow, blue, and pink, matched up with some bright purple buttons (all of which I already had sitting around) and let the muse take me. 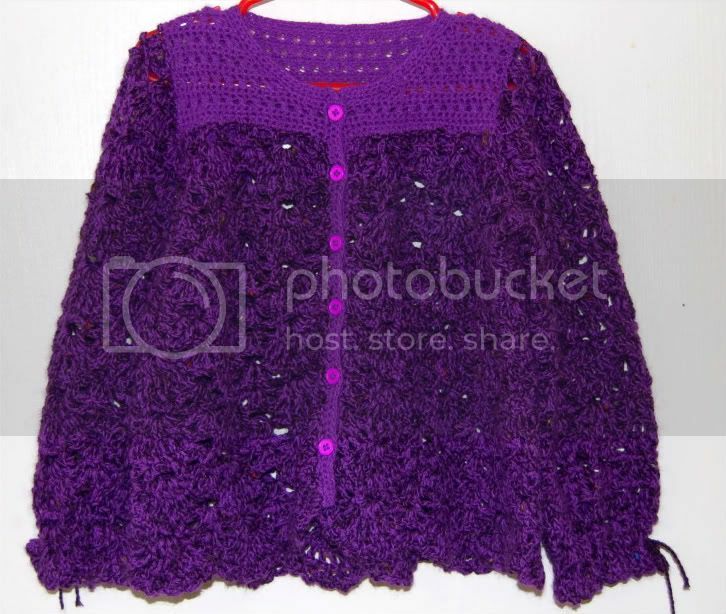 I started and stopped several times before I finally created a little girl's sweater/cardi. It's about a size 7, but with a loose, bell like sleeve and waist. Almost swing. I tied the sleeve with a bit of the cotton yarn to make a cuff. It's a rather unique combination of shades that is dark and vivid all at once and I think it's just perfectly suited to the large scallop pattern I used for the body and sleeves. I would share the pattern link or name, but it came out of my head so I don't have one for you. Just a raglan yoke followed by three rows of scallop (one pattern repeat) and then I divided for sleeves and body. No edging, the scallops create a pretty edge on their own I think.